Novomatic has served up another slice of classic horror in Tales of Darkness: Break of Dawn. This vampire-themed video slot is played using a 5 reel, 50 payline machine and comes with a free spins round that’s played on a 100 payline machine and come with expanding wandering wilds. Play on your PC, tablet or mobile from between 10p and £100 per spin. The visuals will be familiar if you’ve played the other video slots in this series – like Tales of Darkness: Lunar Eclipse. With a graveyard in the background, you’ll see Gothic letters and numbers as well as burning lamps and candles. Top of the payers is the black horse which pays triple your total bet if you land 5 in combination. The male and female vampire symbols are both wild. These replace everything apart from the scatter. The full moon is that scatter. Land 3, 4 or 5 of them on the same spin and you’ll receive a payout of 1, 5 or 20 times your total bet. You’ll also trigger the Free Games feature and with it, 15 free spins. The free spins take place on a machine that offers 100 paylines. You’ll also benefit from the Break of Dawn Bonus feature – the male and female vampire wilds are joined by a combined vampire wild. These can only hit on reel 3. When they do, they expand and fill the whole of the reel. These expanded wilds also move to adjacent reels. The male moves to the right on the 2 free spins that follow with the female wild moving to the left. Better still is the combined wild which moves in both directions. In all cases an extra 2 free spins are added to your total. 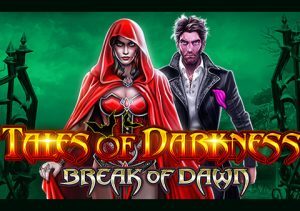 If you like high variance games, then you won’t be disappointed with what Tales of Darkness: Break of Dawn has to offer. The visuals are pretty basic and the base game action is pretty ordinary. It’s the Free Games feature where this game can really spring into life thanks to the wandering, expanding vampire wilds. If you like high risk action that can potentially big rewards, then a trip to this creepy graveyard comes highly recommended. If you like vampires, there’s plenty of video slots to choose from with Playtech’s Vampire: Princess of Darkness and Yggdrasil Gaming’s Wolf Hunters recommended.